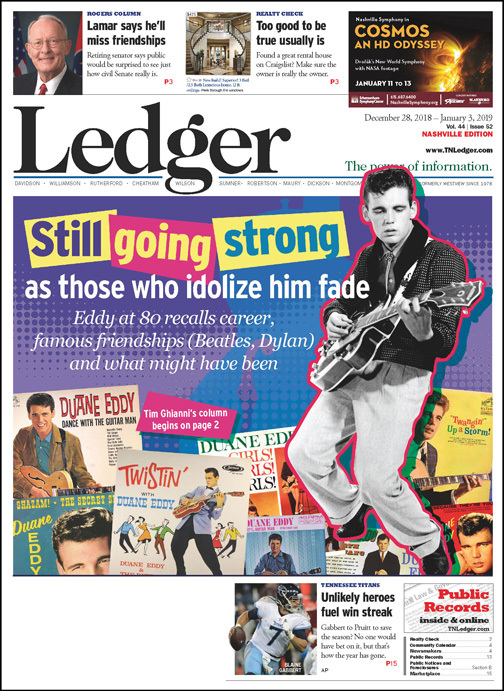 The gentle music giant, once a prospective Traveling Wilbury and a guy whose twangy guitar pulsates the heart of rock ’n’ roll, sits in his Franklin home and talks about – among other things – The Beatles’ so-called “White Album” that he got right from the source when it was released a half-century ago. 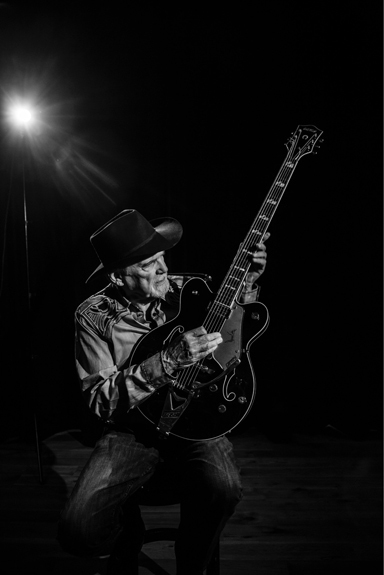 Duane Eddy, whose style of guitar-playing even now is much in demand, worshiped even, in England – where he continues to sell out concert halls and peddle masterful recordings – was a 30-year-old rock ’n’ roll sensation from America back in the waning days of 1968. The man whose rugged sound and his own producing skills kept American rock music from becoming “too soft” in the 1960s, was in London on a business trip to bring audiences to their knees, or at least to their feet. He called a cab and rode to 27 Ovington Square in London, a casual, unannounced journey to see one of those lads from Liverpool who borrowed heavily from American masters, like Chuck Berry, The Everly Brothers, Fats Domino, Elvis – and Duane Eddy – to change the world, sonically and culturally. That building on Ovington Square was the home of Apple Records – The Beatles’ label with the Granny Smith apple logo (full on the front, halved on the flip side). The fellas, who had grown out of their Fabs’ disguises, established the label for themselves – as a group and individually – and to help worthy struggling artists. Duane hoped to hook up with Paul McCartney, the so-called “cute Beatle” until he let his face grow long. 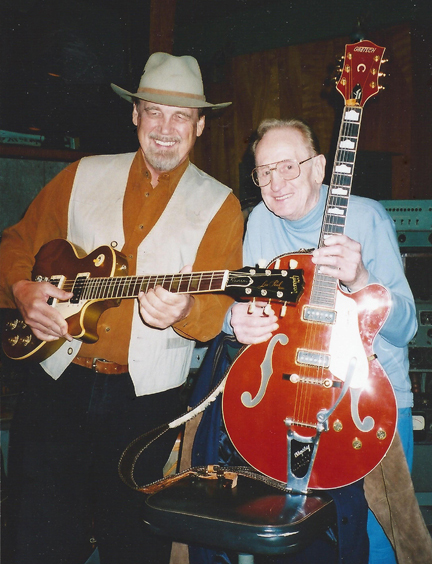 “Guys I was working with knew Paul, so I thought I’d talk to him,” says Duane, a guy I’m honored to call a friend after buying his 45s like “Rebel Rouser,” “Dance with the Guitar Man,” “Peter Gunn,” “Because They’re Young,” and “The Lonely One” back in the late 1950s and early 1960s. Since he produced songs for himself and for others, Duane figured he’d have a nice chat with Paul, who also had taken on some production and was hardly shy about “lending his opinion” to the band’s mastermind producer George Martin and, as it turns out, to his increasingly disgruntled mates. The twang-master from the U.S.A. didn’t figure to find any of the other Beatles around. “It’s back when George was doing his Indian thing” with Ravi Shankar, the Hare Krishnas and his “mentor” Mahareshi Mahesh Yogi, so no telling in what place or on which plane he might be. “John (Lennon) was in the studio in the basement. His paisley Rolls Royce was parked outside,” Duane continues, recalling that half-century-old day. Likely the band’s founder and leader was working on one of his “artsy” recordings with Yoko Ono, stuff that makes “The White Album’s” strident “Revolution 9” seem almost melodic, especially if you play it backward. Guitar players love to comingle and guffaw with others of their breed, so obviously Duane wanted to see The Beatles’ lead guitarist, George Harrison. “He gave me a ‘White Album’ and introduced me to this skinny, young blues singer who was hanging around named James Taylor,” whose first, self-titled album was released by Apple and includes work by Paul and George. It was one of a host of great musical afternoons for a wonderful man whose trek through rock history, helping and meeting other great musicians, could be called “Gumpian” (with an always ready Gretsch rather than box of chocolates). “I just hung around, and George was playing me ‘The White Album.’ He was telling me that Eric (Clapton) had played a couple of solos on it,” Duane recalls. “They (George and Eric, whose soaring guitar work on ‘While My Guitar Gently Weeps’ is among the album’s highlights) were one-upping each other,” basically showing off their kinship with the guys from whom they’d borrowed. Eric might return the favor by telling George he was hanging out with Chuck Berry, for example. “It was just a couple-of-hour visit in the afternoon. I left, and that was that,” Duane says of his time with the youngest Beatle, a man whose very existence in the band had, in a way, been at least informed by the king of twang. “George gave me ‘The White Album’ and gave me John and Yoko’s album with them naked on the cover” (“Unfinished Music No. 1: Two Virgins”). He remembers Beatles publicist Derek Taylor being at the listening session, along with the other Taylor, the skinny singer whose first album George also gave to Duane. It also was a victim of the LP heist. “I never got to play that album” before the thief struck, Duane adds. Of course, James Taylor left Apple and came home to become “Sweet Baby James,” the mostly gentle-acoustic force who saw “Fire and Rain” and worldwide acclaim. “I thought it was a great album. And I realized The Beatles had finally caught up (by using an eight-track recording method). When they started, they had used four tracks and we had 16 and 24 tracks” back in the U.S.A.
That album, actually titled “The Beatles” but nicknamed after its pure white cover with the band name embossed in white on the original releases, is a crazy-quilt mish-mash of the different styles that both made up that little quartet and drove the four men apart. I can remember driving down Waukegan Road and deep into Cook County, Illinois, to some nameless (well, it had a name, but it was a long damn time ago and I’m old) mall retailer – back when every department store had a section where you could buy LPs, speaker wire and phonograph needles – to buy that recording. 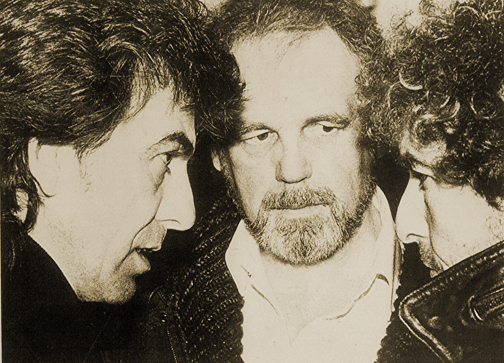 Duane Eddy, center, with George Harrison and Bob Dylan. Eddy remembers driving through Los Angeles with those two plus Jeff Lynne in the car, suddenly realizing the precious cargo he was transporting. Anyway, after I paid the $9 for the two records, I went home to find out Mom and Dad had brought home a new puppy. Pretty great day by a 17-year-old’s standards; so “The White Album” still occupies a corner of my soul. It’s hardly like getting the album directly from a member of the band, as Duane did, but at least I also got Misty, the puppy who lived another 18 years or so. In March of 1986, shortly after the Capitol album was finished back in Hollywood (where John Fogerty sat in on “Kickin’ Asphalt”) and Duane finished the mastering, Harrison – “George and I had built up a friendship” – came calling … or at least looking. “George came over to Hollywood …. He and Jeff (who in addition to ELO is an acclaimed producer for the likes of Harrison, McCartney, Orbison, The Traveling Wilburys and Tom Petty, with and without The Heartbreakers) came over and they used to hang out with Bob Dylan there. “The three of them wanted to find me, so, since they knew I liked country music, they went out to The Palomino, a country music club in North Hollywood. 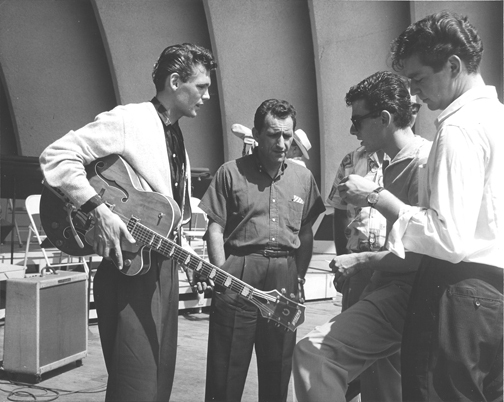 A much younger Duane Eddy rehearses for the first rock ‘n’ roll show at the Hollywood Bowl in 1958, which he headlined. Also on the bill: Frankie Avalon, Annette Funicello, The Coasters and The Drifters. “Everybody from George Jones to Waylon to Freddy Fender played there. Waylon said, ‘I worked The Palomino a year one night,’” Duane says, laughing a bit about the since-deceased club. “John said (later) ‘when Bob Dylan says ‘Play Proud Mary,’ you play ‘Proud Mary,’” Duane explains. “They did a few verses, unfortunately I wasn’t there. “Later, I did hook up with them and we hung out. Then we went to see Dave Edmunds (of the group Rockpile and a recording history much richer) on Vine Street…. “I was giving them all a ride home in this big Suburban I had at the time,” Duane adds, then laughs a bit at the memory. “I looked around, and there was Jeff Lynne and Bob Dylan in the back seat. And George Harrison was in the front seat with me. Duane managed his voluntary chauffeuring duties fine, and as the evening wound toward an end, he pulled off the road at a restaurant to let his first passenger, Dylan, out. “Bob was riding his motorcycle. He had parked it around the corner from the restaurant door. We waited to make sure he got onto his motorcycle. It was a big Harley. Bob walked over and looked at it. He stood it up, then set it back down and went into the restaurant. Deciphering what Bob Dylan is thinking probably is a tough task even for late-night rambling rock ’n’ roll stars, so they decided to leave him to his own devices with his two-wheeled gypsy queen, or whatever, and continue their trip to their various abodes. The history of that band and, of course, its members would go on for many paragraphs and it lasted for two fine albums. What people don’t know is that Duane was a handshake away from being a member of that band made up his superstar cohorts. “They considered it for a while, and we had a little conversation,” Duane recalls, adding that it really wouldn’t have worked out well, as The Wilburys’ main attraction was the mixture of such familiar iconic voices rather than instrumentals, his stock in trade. He did ponder the pleasure of doing a bit of Wilbury-accompanying guitar work, mainly for the joy of “hanging out with those guys,” but it never worked out. 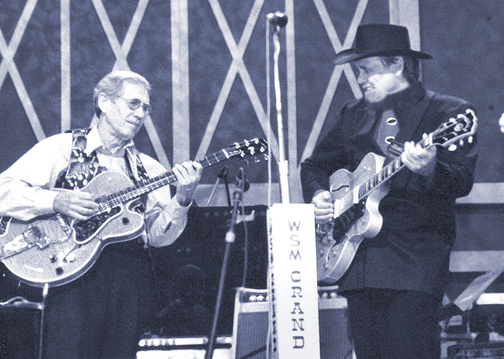 Instead of Duane Eddy, the vocal group recruited the man who likely is the best vocalist in rock history, Orbison. Duane won’t say this, but it may have worked out best for him to not be a Wilbury. That band may have been jinxed a bit, as three – Harrison, Orbison and Petty – died before they got old. That Wilbury of a night was hardly Duane’s biggest in Hollywood. For example, Duane owns an historic place in the history of Tinseltown’s most hallowed venue. “I was the first person ever to headline a rock ’n’ roll show at The Hollywood Bowl. In 1958. Frankie Avalon. Annette (Funicello). The Coasters. The Drifters. It was a big show…. “In 2008, we celebrated the 50th anniversary of (the Hollywood Bowl).” On the bill that night were B.B. King, flutist James Galway and Liza Minnelli, as part of a showcase of important acts who had played there during the half-century. There’s deep affection in Duane’s voice when he talks about B.B. “I first met him in Oakland. I got there late. Jerry Lee Lewis and some other people were on the bill. I’m backstage. We did our bit and it turned out to be all right. “Then he stepped back and let me go, then he introduced himself: ‘I’m B.B. King.’ I said, ‘Omigosh, it’s now my turn to hug you and kiss you on the cheek.’ Then we proceeded to have a long talk. We had a great time. To spend time talking with this kind genius is to go through an encyclopedia of show biz stars who either look up to him or at least consider him their friend. The friendship with the actor Boone can be explained if you ever listen to the instrumental version of the theme song from the classic television Western “Have Gun – Will Travel.” Yep, “The Ballad of Paladin” (Boone’s “knight without armor in a savage land”) was played by Duane, who also guested in a couple episodes. 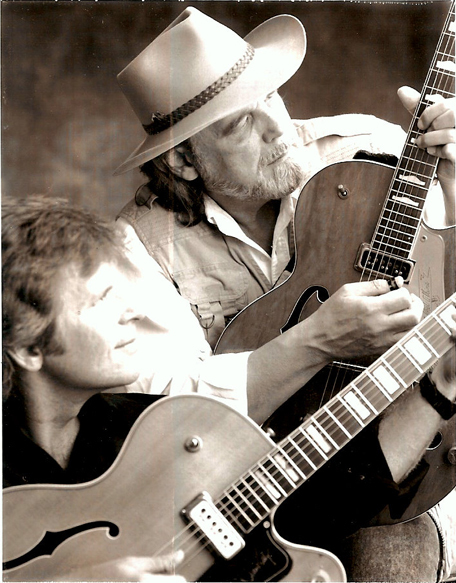 A loyal friend, Duane helped keep Boone company and gave him comfort in 1981 during his dying days with throat cancer, the same ailment that claimed his Beatles buddy, Harrison (whose throat cancer spread to his lungs and brain) 20 years later. A couple of months ago, Duane and his wonderful wife Deed – they’ve been together since 1973 – were in England for concerts when Olivia Harrison, George’s widow, looked them up. Her husband’s friendship with Duane sparked reminiscences, among those her description of George’s waning days at Friar Park, their Victorian neo-Gothic mansion and estate in Henley-on-Thames in the British countryside. “She said Paul would come there and she’d look out the window and see them walking … arms around each other’s necks … talking up a storm. It looked like they were having the best time. “They still had that love for each other. I guess they all did,” he says of The Beatles. “One of the little bonuses that have come along in later years is having these guys who are giants in the music business tell me how they grew up on my records. But Duane’s no nostalgia act. “I’m still working,” he says. “I just got back from doing a couple of shows in England. One was at the Palladium in London, which is like working Carnegie Hall in New York City. 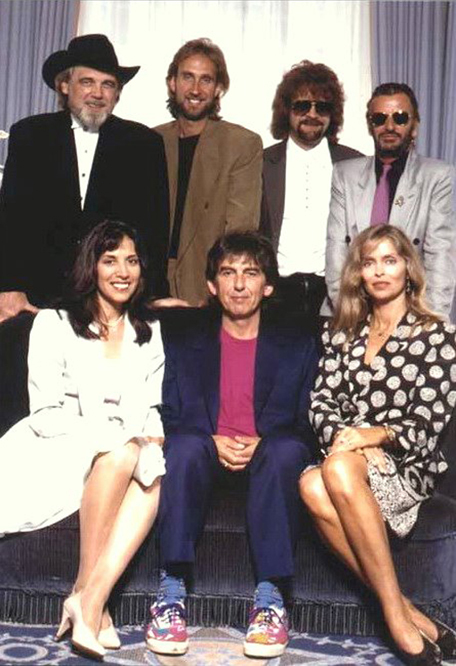 Olivia Harrison, wife of Beatle George Harrison, along with other Beatles wives, organized a press launch party to publicize Nobody’s Child: Romanian Angel Appeal, an album to help Romanian orphans. Front row from left, Olivia Harrison, George Harrison and Barbara Bach Starkey (Ringo’s wife). Back row from left, Duane Eddy, Mike Rutherford (Genesis, Mike & the Mechanics), Jeff Lynne (ELO and Traveling Wilburys) and Ringo Starr. These artists, along with other special guests, participated in the 1990 fund-raising recording. Even so, he’s not put out an album since 2011’s “Road Trip,” only released in the U.K. The gentle soul who continues to ply his trade, showcase his artistry, notes that there are “more crags and wrinkles now,’’ forcing a double-take when he looks in the mirror. “That’s not me,” he says, with robust laughter. “I can’t get my mind around the fact I turned 80. It doesn’t seem right somehow. But I know I am, and I know I’ve been doing this recording business 60 years this year. And those thoughts and the memories of six decades as a guitar groundbreaker are being captured in an underway autobiography.